This Nativity set is carved from teak wood by an artist named Pascal. He lived in Bamako, Mali. Finding Nativities in Mali is not easy because it is a Muslim country, but artists in local markets will make them upon request. 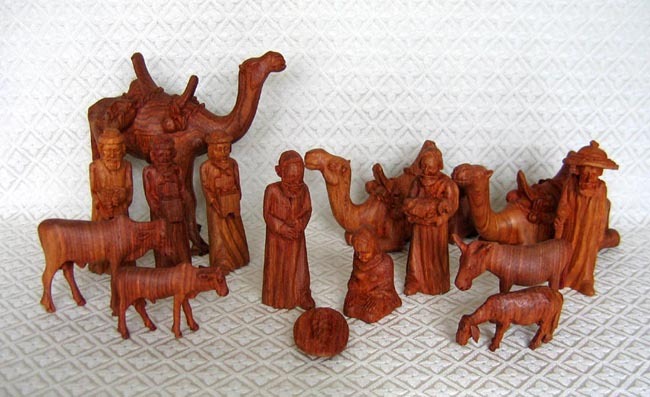 ​The set includes 15 figures: The Holy Family, a shepherd holding a lamb, a shepherd with a round hat holding a walking stick, two zebu cattle, a donkey, a sheep, three wise men, and three camels. The standing camel measures 6.5 inches tall. Joseph stands 4.5 inches tall.